This is the time of year when skincare starts to get serious. Summer has been over for months and winter is here. So you should be thinking of having a serious winter skincare routine. Especially a routine that will take your skin from the frigid winds and dry air until spring time. That includes eye cream. Eye cream is very important for anyone over the age of 25. It is at that age when visible signs of aging start to show in the eye region. Usually with dark circles but it can be puffiness or other signs of aging too. 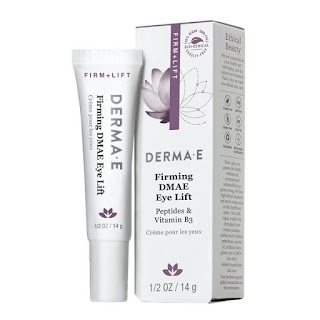 Derma E is the skincare company that makes many different types of eye creams and today I'd like to discuss their Firming DMAE Eye Lift. This cream is for women and men who are in their late 30's to mid 60's. It visibly lifts, firms and tightens the delicate area around the eye while smoothing crow's feet with this doctor-developed, multi action eye treatment cream that contains advanced natural ingredients. It contains InstaLift® Goji Berry glycopeptides, which add further firming, lifting and tightening anti-oxidant power. Advanced peptides Argireline® and Matrixyl® synthe'6® work together to soften facial muscles and synthesize new key components helping smooth wrinkles and discourage new lines from forming. Hyaluronic Acid, also known as nature's moisture magnet, infuses a surge of cooling eye moisture helping leave skin soft, smooth, tone and rehydrated. With continued use, this pro-collagen and pro-elastin blend leaves the delicate eye area firmer, smoother and younger-looking. This cream is 100% vegan, cruelty-free, paraben-free, sulfate-free, mineral oil-free, lanolin-free, gluten-free and GMO-free. To use: Apply a small amount of Firming DMAE Eye Lift onto the fingertips and using light pressure. Pat around the entire orbital area. For best results, use morning and evening. May be used under make-up. Firming DMAE Eye Lift is a great cream. After two-three weeks use you will notice a difference in the skin around your eye area. I have been noticing more bags under my eyes recently and with this cream it tightens and firms the skin while decreasing puffiness. All while moisturizing the eye area and keeping it smooth. Crow's Feet will become a thing of the past after using this for an extended length of time. It also helps take care of dark circles and anything else that your eyes need. Derma E Firming DMAE Eye Lift is a available online at www.dermae.com. Or in many stores across the United States, such as Whole Foods, Target, CVS and Sally Beauty Supply. Go to the store locator to find Derma E near you:http://dermae.com/locations.html. Like Derma E on Facebook:https://www.facebook.com/dermaenaturalskincare; Follow Derma E on Twitter: @derma_e; Subscribe to Derma E on YouTube:https://www.youtube.com/user/DermaEBodycare; Follow Derma E on Instagram:http://instagram.com/dermae# and Follow Derma E on Pinterest:http://www.pinterest.com/dermae/.